Avenue Web Media uses the award winning Drupal CMS as its main development platform. Because of this, our graphic design team specializes in custom high-quality Drupal themes for professional, attractive, high-end graphics. If you are looking for professional, custom Drupal themes for an existing website, we have exactly what you need. Our clients find in our products a level of quality and attention to detail that is very uncommon in today's Internet. 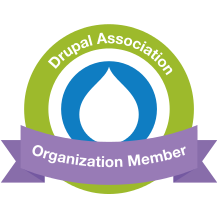 If you already have a design and are looking to incorporate that design into Drupal, please visit our PSD to Drupal Theme services page. It is no secret that the quality of your visual design largely affects the initial impression that your site makes on your visitors. A stellar design will have a great impact on sales, branding, and the customer experience in general. Just as important, our properly built and search-engine optimized Drupal theme can also give you a big boost in search engine rankings. Avenue Web Media was able to design a great Drupal theme for our website that fit both our target demographic and our expectations. We were also pleased with the way AWM paid attention to the details during the design phase. Our experienced team of web-oriented designers can turn any dream into reality and work with any style. We build unique and attractive graphics that represent who you are and convey exactly the right message. We build our code from the ground up using W3C standards and taking into account accessibility guidelines (WCAG) - almost every single line of code is written by hand for each new project. Our xHTML and CSS are standards compliant while also supporting all the major browsers. Our team tests for Firefox, Internet Explorer 7 and 8, Google Chrome, Opera and Safari. As a full-service web development company, we also specialize in Online Marketing which allows us to produce fully optimized and fully crawlable sites, thanks to our intimate understanding of search engine behavior and ranking factors. Proper optimization makes a huge difference that is apparent immediately. As soon as our sites are deployed they get picked up by the search engines. Our team has plenty of experience developing mobile-first, multi-platform themes that can operate seamlessly on all devices, including all desktop sizes, as well as mobile platforms such as iPhone, iPad, Android, Blackberry, and the gamut of tablets. Whether you need an elegant responsive Drupal theme powered by Omega, or a custom platform-specific mobile version, AWM will bring to life even the most complex of adaptive browser experiences, to any screen size and platform. Our standard Custom Drupal Design and Theme package starts at $2,450. This includes the development of a professional graphic design for your site, and the conversion of that design into a professional Drupal theme. For the theme code, we take into account extra styling for all core modules and the front page. We can also do Flash animation and other forms of advanced customization, such as custom content types, Views and Panels, etc. If you already have a design that you'd like us to convert to a Drupal theme, then the starting cost for the graphic design to Drupal theme transition is $950. Cost and timeframe will vary depending on the amount of features and extended modules that you'll require for your project. Visit our PSD to Drupal Theme services page for more information. If your Drupal website needs a professional and effective theme, contact us now! • How faithfully can you reproduce our PSD design? We can normally reproduce the design exactly right, almost pixel for pixel. In addition, we often adjust the design while retaining the artistic integrity, to allow the theme to expand or contract gracefully where the CMS calls for dynamic content areas. In other words, we faithfully reproduce your original design with all of its artistic details, while we also adapt it seamlessly to the requirements of the CMS. • Can you guarantee that the design will behave correctly in all major browsers? Yes. A big part of our job is to make sure that the theme accurately represents the intended look and feel regardless of the browser. To this effect we use modern standards along with tried-and-true development techniques to maximize cross-browser compatibility, and we test our work in all major browsers including all major versions of Internet Explorer, Firefox, Safari, Chrome and Opera. • How long will the theme development process take? - Making sure that your custom Drupal theme meets all the requirements of your installation, along with its content and modules. More than delivering the theme files, we make sure to deliver a fully working solution that meets all of your needs for the project. Ready to get started or perhaps have any questions? Contact us today!